I encourage everyone to take a look at all the entries for this Giveaway. There were designs I had never seen before, including this winning motif. Plus, I was pleased to see some of my favorites like the Wool-Eater Blanket chosen for entry. The crochet world on the internet is enormous! There are just not enough hours in the day to look at all the pretties AND get any crocheting done! Diane will receive a copy of the beautiful book, Seamless Crochet, if she contacts me via email (crochet@craftgossip.com) within the next 48 hours. I’ll be contacting her via private email also. I have also emailed LaceCrochet, the person who posted the winning motif to ascertain the source of the pattern so that we can all make our own version of it. Click on the link to see the larger version of the Floral Heat Motif and view all the other exquisite designs LaceCrochet has posted. I’m sure you’ll be as amazed as I was to see such beautiful work. Great fun! You can view all the entries in the Comments section here . That motif is really gorgeous. I’ll be waiting to find out where I can find the instructions, because that would be gorgeous framed for my mom for Christmas. I just saw the November winner of this was Diane. Am I the right Diane? Sorry. It was a different Diane. 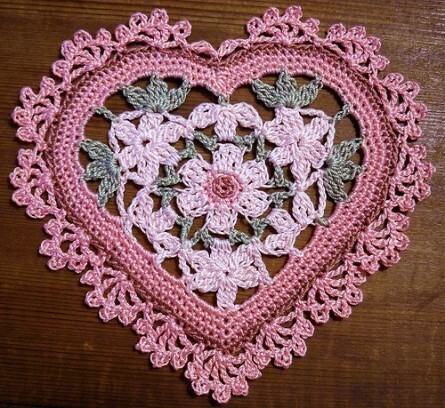 Please tell me where I can get the pattern for this as it would make a perfect framed gift for Valentines Day. Thank-you Peggy in Pa. I agree that this would make a lovely Valentine’s Day gift. However, my attempts to contact the crocheter who made this beauty have been in vain. There are some similar patterns on the free Gutenberg.org site in the Godey’s Ladies Book – but I believe they are all round. You might check there for further inspiration.